(CNN) – Sen. Harry Reid said nothing of his earlier claims that Mitt Romney had not paid taxes over a ten-year span in a Friday statement joining Democrats in responding to Romney's release of tax-related documents on Friday. The Nevada Democrat and Senate majority leader called Romney's accounting "galling" and said the documentation "reveals that Mitt Romney manipulated one of the only two years of tax returns he's seen fit to show the American people – and then only to 'conform' with his public statements." Meanwhile, President Barack Obama's campaign also released a statement on Friday saying the GOP candidate took advantage of "complex loopholes and tax shelters only available to those at the top." Over the summer, Reid caused a stir when he claimed a source - who he has not named, but identified as an investor at Romney's former financial firm, Bain Capital - told him the GOP candidate did not pay taxes over a decade, though he did not specify which set of ten years were included in this claim. In addition to his full 2011 returns, Romney released a letter from the accounting firm PricewaterhouseCoopers saying Romney had owed and paid taxes over the last 20 years. The letter said the average effective rate over that period was 20.2%, and the lowest rate was 13.66%. Romney has said he was CEO of Bain Capital from 1984 through 1999, when he left to lead the Salt Lake City Olympic Games. Reid referred to Romney's returns as completed by "accounting wizards" and charged in his Friday statement that the question remains, "what else in those returns has Romney manipulated? "We already know Romney has money in tax havens in Switzerland, Bermuda and the Cayman Islands. What we don't know is why he refuses to be straight with the American people about the choices he's made in his financial life. When will the American people see the returns he filed before he was running for president?" he said in the statement. "Governor Romney is showing us what he does when the public is looking. The true test of his character would be to show what he did when everyone was not looking at his taxes." Obama's deputy campaign manager Stephanie Cutter said in a statement that while Romney's Friday release "continues to mask Romney's true wealth and income from Bain Capital, leaving the American people in the dark about critical details about his finances, it does confirm that he continues to profit from millions of dollars invested overseas. "These types of investments, the use of tax loopholes, and the resort to foreign blocker corporations enabling him to reduce his U.S. tax obligations, all raise basic and still unanswered question – why does Mitt Romney not just release the full returns, instead of the bare summary he has provided of the last 20 years, so voters can make their own judgments about Mitt Romney's finances?" Cutter continued. "As Mitt Romney's father said, candidates should release several years of returns, because one year could be a fluke. President Obama, Vice President Biden and nearly every other candidate in recent memory has met that test, but Mitt Romney continues to fail it." 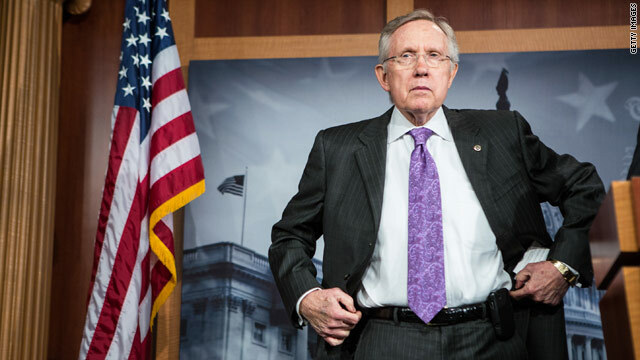 Here's a shocker: Harry Reid is a conniving, petty, lying, worthless piece of crap. He can only play the blame game because he has absolutely nothing, and I mean NOTHING, that he can or will bring to the table. When do we get to see Harry Reid's and Dianne Feinstein's tax returns?? How can anyone not see this administration and the democrats in congress for what they are? Hypocrites that are spreading malicious lies stated as facts to an uninformed public. @The Elephant in the Room – we have already established in 2008 that Obama had several axes to grind – including his wife's policy of forcing poor out of the University of Chicago Hospital System. Obama's prejudices toward capitalism had him basically destroy GM by putting the unions and the democratic party in charge of it and driving dealerships out of business that were "Republican". But raising these points were considered racist in 2008, and even today. We were not unreasonable then. Where are Obama's college records? Can we see a copy of his passport? Reid needs to crawl back into his hole and button it. I hope Nevada finally wakes up about this guy. He's a typical crooked politician. Well there's just no winning with you, is there Dirty Harry? I wouldn't show mine either if mine for a Harry Reidless. What gutter pipe did this guy Reid crawl out from? Romney made his money square and fair in the private sector. Senator Slimeball and his mook son make money from corrupt government schemes. I'll bet not one of these critics didn't use the tax code to their advantage. Any man that's willing to give 30 percent of his income to charity is a man who has a good moral compas. Romney gets my vote. Camrade Leader Harry Reid: why don't you and your counterpart in the other house, Princess Nancy get together with you mullah, Barack Hussein Obama and his number two, Joe Biden and all of you release your 2011 tax returns. Let's see how much you donated to charities other than yourself. Hardy har har har reeeeeeeeeeeeeeeid! The saddest part of this entire saga is that this is the most positive Liberal spin CNN could put on this. Um ... Obama ... your party had the Presidency and both houses for two full years ... if you want to complain of those loopholes ... do tell ... why didn't you change them? In Reply to "the elephant in the room." Romney-Ryan proposal would allow some people to pay no taxes? SOME people. Darling, the tax code with all of it's little wrinkles and give-aways allows almost 50% of Americans to pay no taxes right now! What are you talking about? Conflicts of interest? They must place their holdings in blind trust, just your hero Obama. I would mention Rangel and Geitner and a host of others in his administration that have been cited, investigated and/or censured for failing to pay their "fair share," but that would be discourteous. If Mitt Romney released 20 years worth, Reid and gang will say that he hid everything in the 21st tax forms and would want to see that. Mr Reid why don't you set an example and show us yours to see how you cheat the system. You were elected to serve not to skim money off the top so you could become a millionaire. What an easy life you have lead! Harry Reid should shut up. It is time for you to show your own income tax. How much do you donate to charity – dirty, and ugly Harry? Mr. Reid owes Mr. Romney an apology. The more money Romney gives to charity, the angrier Reid gets. And Dirty Harry is at the top. I still could care less what Mitt Romney does with his money, but I care a helluva lot about what Barack Obama is doing with MINE !!! It sure seems like Harry and the Democrats are jealous of success.